Happy Monday everyone! I hope you managed to get everything done on your list this weekend - I made a fairly big dent in mine except I didn't get to put together a bookcase that I want to add to my living room. Other than that, I feel accomplished, and still managed to spend some time at the park with LO and take DH out to dinner. I also managed to catch up to episode 7 of the Game Of Thrones series. That show is addictive, and I'm not looking forward to the last episode that I keep hearing a lot of groans about. Don't tell me what happens! LOL. I realize that I haven't used an indie glitter in a long time, so I have one of my recent purchases by Elevation Polish called Rue Manin. It's a gorgeous medium purple crelly with light and dark purple squares and light purple hexes, with a smattering of silver flecks. It had a really lovely formula that applied easily and built up to full opacity with three coats, although two coats may have been enough if you don't mind a little VNL. I finished it with a layer of Poshe to smooth the glitters down. 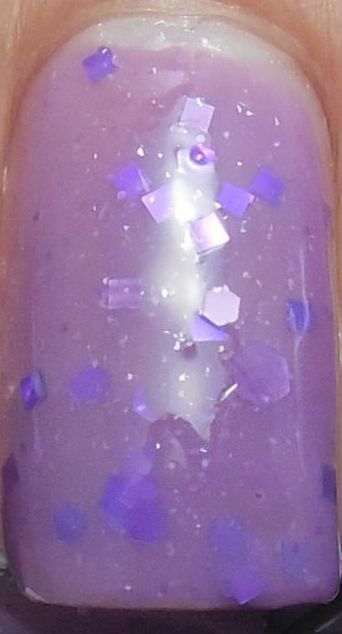 I adore this shade of purple and I love the two shades of glitter mixed in. It's not a glitter bomb or a speckle polish, but it's a happy medium between the two. Elevation continues to make polishes that are keepers for me each time I swatch them, and the reasonable costs keeps me coming back for more. What's your favorite indie line?